In the last week of October, using apples from the farm, such equipment as we had and our own hard work Paul and I started to produce what we hope will finish up as 20 gallons of quality Normandy cider. Many of the trees produced fruit, but some of them are clearly biennial bearing and had no fruit and some had finished and fallen before we started so we settled on four varieties that were heavily laden and ready for picking when we needed them. We still don’t know the names of the varieties and were going to send samples to Brogdale for identification but they have let us down. It’s not a cheap procedure and I emailed their information address first to check that there was a reasonable chance the experts could name fruit from France. I had a speedy reply from a PA who said my query had been passed onto the identification team but no reply from them and a reminder sent to the PA has not been answered. So, we’re still using our working titles for the trees; Beatrice, Katherine, Lisette and Phyllis. Beatrice is a crisp red apple with a light bloom. Her tree was covered in fruit. Katherine ripened slightly earlier, another tasty, slightly acid fruit. 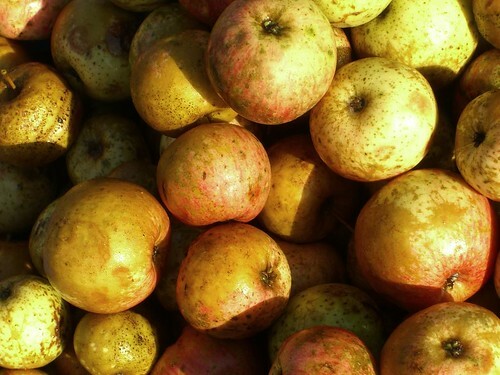 Lisette apples are small and golden, quite dry fleshed and with almost the flavour of toffee. Phyllis has similar fruit to look at but the taste is more tannic, not quite so sweet. 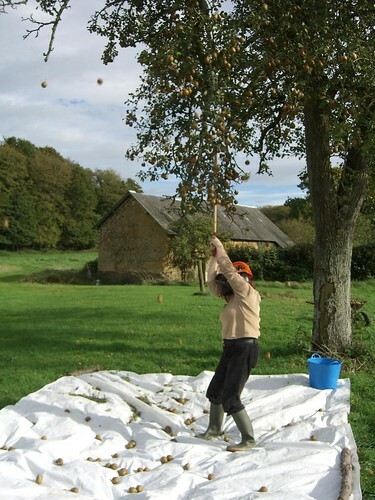 It was taking too long to pick the fruit manually and we settled on a system of climbing the ladder, hooking a rake into the branches and shaking the apples down to land on a spread tarpaulin while the other held the steps to stop them falling over. It’s easy enough but apples raining down induce more than thoughts of the theory of gravity and a principle of never looking up was soon adopted. Later on we started using the chainsaw helmet but it did look ridiculous. Picture of Katherine in the hand. 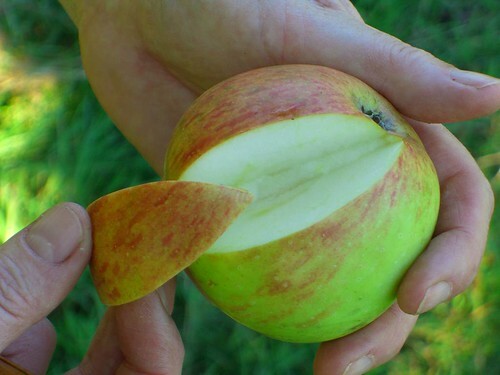 Cider apples differ from eating apples as a good cider consists of a blend of juices, some sweet, some sharp with edges of bitterness and tannin that give a refreshing full flavour to the brew. This means that even though many of them are full of sugar they’re not particularly nice to eat raw. In fact our chosen varieties were all quite pleasant when fully ripe although none of them could compare to a decent Russet or Blenheim Orange. We worried about this a bit, fearing our finished juice would lack the acidity and tannin necessary to inhibit noxious bacteria and give a good finish to our cider. In order to get reassurance we armed ourselves with indicator papers and a hydrometer to assess the sugar content of our finished juice. We also decided that to minimise risk we would make all our cider of blended juices in the hope that deficiencies in one juice would be compensated for by the excesses of another. This is standard practice in cider making and most commercial brewers work with several apple varieties to produce their speciality. We also picked some pears to make some perry. After the fruits were picked they were washed and prepped ready for the next stage.